I know it’s the third week of June. A little late to show up with the gratitude post for May at this hour of the month. But hey, better late than never. Right? Honestly speaking I don’t remember everything that had happened last month. With the summer holidays started I’m busier than ever with no time to think or write. From what I can remember, May wasn’t bad. The month began with Arizona Teachers strike and hence schools were closed the first week of May. It was definitely a busy week with the unexpected holiday from school. When the strike was called off we parents were grateful. Plus the demands of the teachers being accepted was another reason to be happy. Akku kept me busy as usual. There were good and bad days. I have to concentrate on the good days to draw energy to get through the bad days. There were injuries that needed immediate attention, but all is well. All in all, I can’t complain. Three. That’s how many books I read last month. That too I finished the third book before the 20th of May. I sure was on a reading spree last month. The month began with Eleanor Oliphant is completely fine by Gail Honeyman. I loved this book. Honestly, I didn’t like it when I started to read the book. Few pages in, it was nearly impossible to peel me away from Eleanor. Soon I went on to investigate a case with Nancy Drew. Oh, that Shadow Ranch mystery was a difficult one to solve, but it was fun too. A light read with a satisfying feel. And then I picked up A Thousand Splendid Suns by Khaled Hosseini. Dear God, what a read that was! If I thought Eleanor was making me emotional, that was nothing compared to what Mariam and Laila did to me. I finished the book in four days. I cried many times accompanying Mariam and Laila and the paths their lives took them. This is not the post to express what I felt exactly, but I must say that this book left an impression on me that no other books could, ever. It wasn’t a great month blogging-wise. I don’t remember writing much. 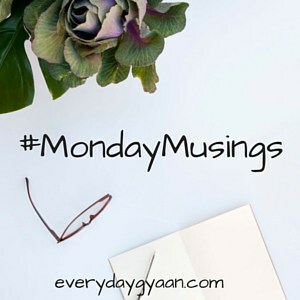 I don’t remember publishing posts every week on both the blogs as I promised myself. I remember feeling bad about not being able to read and interact with other bloggers. I remember wondering about why I am not able to give a couple of hours every day to something which I love so much. Well, I am still wondering the same! Wonderings aside, blogging is still my goto avenue. When I have nothing to lean on, I open my laptop read a few favorite blogs and try to type my heart out, even if it stays in the draft folder forever. I am so thankful that four years ago around this time I set out on an adventurous journey to become a blogger. That first year when I met with veterans of the blogging world and tried to squeeze myself in among the talented ones without any idea how much this place is going to help me – I thank my stars for abandoning me in that dark and dingy alley, forcing me to dive into a new world and discover the wonders that followed. I was constantly running on a low energy mode which I think is the aftereffect of running after my little one. I had made progress in being consistent with the exercise regimen, but of course, not with a reminder that nothing will last forever. My yoga practice needs rekindling, again. Falling out is a motivation to fall back in – meaning I will find my rhythm again. That’s how my friends my May went by. How was yours? Linking with Monday Musings at Everyday Gyaan and Gratitude Circle at Vidya Sury. That sounds like an almost perfect May, Vinitha. So happy for you. It’s okay if you didn’t find time to blog. With summer holidays, blogging is bound to suffer. That is a good bit of reading that you did. I have read a Thousand Splendid Suns and know exactly what you mean. Hope you find the rhythm back in your fitness routine. Have a great June! With your Mother’s day celebration and feeling special feeling, I hold you guilty of giving me premise to create jealousy. And then I think I will be fine because you called me a Powerful Writer on my birthday post. So thank you for that. Hope you are having a wonderful June. You read three books! That’s great, VIni! What with all the activities to keep you on your toes, you managed so well! How wonderful and warm it must feel being appreciated by the men in your life! I’m so glad that you are continuing to blog, Vinitha. I’m sure once Akku is older, you’ll get back into it full swing. I’ve got both the books but haven’t read them yet! Falling really behind in my reading. It is never too late for gratitude. Looks like you had a busy but lovely month! You know how irregular I’ve been at blogging but the good thing about this meduim and community is you can always come back! Khaled Hosseini is one of my favourite authors, he can tug your at heart strings, make you experience emotions like no other! Sounds like a good May! I’ve been hearing so much about Eleanor oliphant, I think I will have to pick up this book soon!